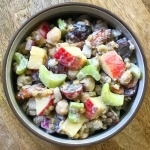 This delicious revamp of the Waldorf salad is delightfully crunchy and packed with plant-based protein with the welcome addition of chickpeas and lentils. Bursting with flavor and endless bites of crunch, this is an undeniably refreshing salad. Optional: Serve on Spinach or Romaine lettuce or simply enjoy alone! Carefully sort the dry lentils and rinse (see recipe notes). In a medium sized saucepan, add the lentils to unsalted water. Bring to a boil and reduce heat to simmer. Simmer uncovered for 20 to 25 minutes, stirring occasionally, until the lentils are tender but not mushy. Once cooked, drain excess water and set aside to cool. Once the lentils have cooled, gently grab handfuls at a time with a paper towel to remove any extra water. Or transfer the lentils to a paper towel lined plate and pat dry. Rinse and thoroughly drain the chickpeas. Again, pat dry the chickpeas with a paper towel to remove any extra water. Don’t worry if the outer shell of the chickpea pops off during this process. In a small mixing bowl, combine the mayo, apple cider vinegar, lemon juice, salt and pepper and whisk until well combined. Refrigerate until needed. Prepare the remaining ingredients but chop the apple last to minimize browning. In a large bowl, combine the lentils, chickpeas, grapes, celery, red onion, apple, pecans and dressing. Using a large spoon, gently mix until well combined. Chill in the refrigerator for at least 1-2 hours before serving. Enjoy as is or serve on a bed of spinach or romaine lettuce. Leftovers may be stored in an airtight container for 2-3 days (see note). This salad is best when enjoyed within the first day of making it. Sorting the Lentils: Sprinkle the lentils on a white salad-sized plate in small increments to easily spot any stones or debris. Once checked, transfer the lentils to a fine mesh strainer or colander. I have found it’s faster to sort lentils in small batches rather than the entire amount at once. Cooking the Lentils: I prefer to simmer the lentils uncovered even though most packaging instructions will tell you otherwise and to cook them covered. I find simmering covered tends to create softer lentils whereas we want them crunchier for this type of salad. Try experimenting to find your own preferred method! Make it Vegetarian: If you’re not trying to avoid eggs, then you can go with a traditional mayonnaise. If you want to scale back on the mayo, you can substitute half of the mayo with 2% Greek yogurt. Note: If substituting half the mayo with yogurt, you may want to scale back on the lemon juice. This may alter the dressing to a slightly bitter note. You can always adjust and add more lemon juice as you taste. Make it Vegan: Use an egg-free mayonnaise to make this salad vegan. I used Hampton Creek’s Just Mayo and it worked perfectly. Another popular brand to try is Vegenaise. Storage: As mentioned in the post, vegan mayo has a tendency to become more runny after a few days than traditional mayo. Enjoy the vegan version within the first or second day of assembling this salad. Or keep the dressing separate from the other ingredients until closer to serving. Don’t forget to chill the salad prior to serving.